"It's impossible for me not to fall in love with this sweet but extremely capable little console, and think up countless applications and justifications for purchasing one - and plenty of people will feel the same!" The affordable baby SSL we all wished we could have is finally here. 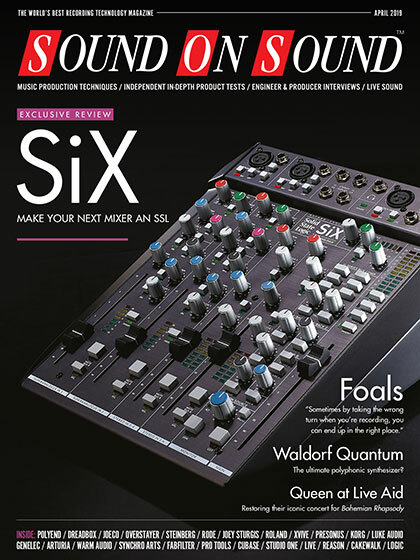 SSL SiX is a premium SSL desktop mixer - superanalogue, fully balanced and full of processing. It features on the cover of the new issue of Sound On Sound magazine with an in-depth 15 page review. "I have to say that this is a lovely little console which performs as well, and is as nice to use, as any of its much larger siblings. It really is a remarkably versatile and capable little mixer which slots in very elegantly alongside the X-Desk and XL-Desk in SSL's range." "Sound wise, the SiX's performance is exemplary. Headroom margins are generous, noise and distortion are as low as best practice allows, and the bandwidth is huge - all of which means this desk sounds completely transparent. And yet, the one-knob compressors and EQ on the mono input channels can be used creatively to shape sources when necessary, and the stereo bus compressor does exactly what is needed to glue a mix together." "The most affordable SSL ever, this is an impressively well-built mini-console. Its well thought-out and versatile capabilities should make it very attractive indeed for a wide range of small-scale but quality-conscious applications”. The full review can be found in the April 2019 issue of Sound On Sound magazine or by clicking here. The SSL SiX is available now priced at £999 RRP ex VAT. Solid State Logic is distributed in the UK by Sound Technology Ltd. For more information please call 01462 480000 or visit www.soundtech.co.uk/ssl.